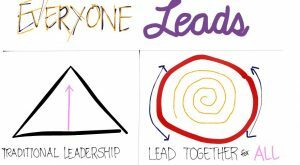 The way I understand it, leadership is almost exclusively about an intentionality, not about our position in society or in an organization. It’s the intentionality of caring for the whole and of taking responsibility for all that matters to us, within and without. 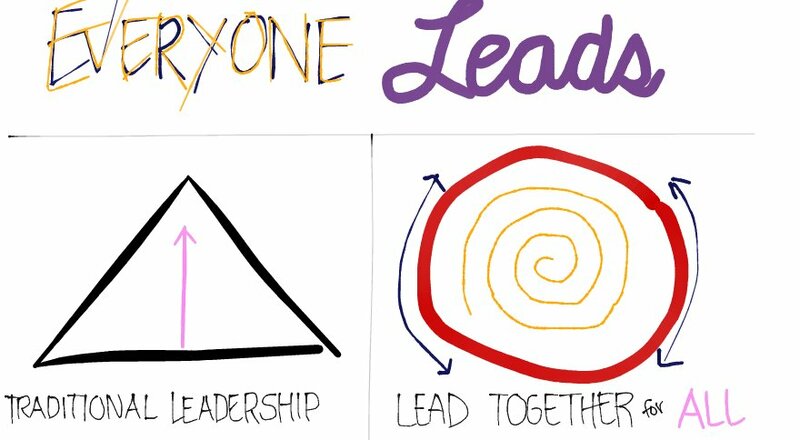 I want so much to increase the possibility of all of us stepping into leadership. I totally and completely believe that it is only a myth that says only some of us can lead, and everyone else must only follow, not think for themselves, not participate in shaping a collective future, from the personal to the global. Yes, if everyone were this empowered, we would have to restructure our social and political arrangements, and that’s precisely what I believe is needed for our species to survive and thrive. I have written and said before: I am quite confident that anyone who saw me as a child would not have predicted that I would end up having a life in which many people look to me for wisdom and inspiration, in which I am visible in the world in a clear role of calling for and supporting transformation on all levels. These past few weeks, I’ve had some extraordinary experiences regarding my own leadership, and I intuitively am drawn to sharing these with you all, my readers. I feel a bit shy about it, because it’s a personal exposure of a kind that I rarely do. It still feels right, despite the nervousness. The reason, most likely, is my hope that my experiences and what I am learning from them will inspire some of you. If I can support some of you who don’t think of yourselves as leaders to stretch your wings further, that would be tremendously satisfying. If I can also create some curiosity in some of you who occupy positions of “official” leadership to consider shifting your approach ever more towards a collaborative and vulnerable path, then I would be doubly satisfied. These experiences are leading me to nothing short of a restructuring of my sense of self, challenging my overwhelming and defining experience of being other, different, and therefore separate. Here are four of these experiences. The board of the Center for Nonviolent Communication, the global organization founded by Marshall Rosenberg in 1984 to support his efforts to bring Nonviolent Communication (NVC) to the world, has launched an ambitious project to find a collaborative path, identifying a future form of how the global NVC community might want to organize itself (click here for more information). The first part of this process relies on Synanim, which is software designed for collaboration on matters of importance to groups. Small groups of people simultaneously login to the software, and begin answering questions in an iterative way. Each round, each person chooses one of the previous round’s responses – their own or someone else’s – and improves on it based on what others have said. After a few rounds, they all vote on which is the answer that most clearly captures what is important overall to the group. Then one or two people are promoted from this group to the next phase. Part of what’s so intriguing about this software is that it selects the people promoted automatically and anonymously, based only on how often their response was picked by the group, and based on how often they picked the same response as others. With my history and sense of self, I was quite certain that I would be out of the process after the first round; that I would be a major outlier. My initial response was indeed almost entirely different from what others wrote. In the next iterations I worked diligently at integrating as many of the other people’s points as I could into a cohesive whole. Others started gravitating more and more towards my responses. To my astonishment, I was selected by the system for the next round. The same exact pattern has now continued to happen in subsequent sessions, in a remarkably similar way. It’s particularly instructive that the system considers the people selected “leaders” of their groups. Now, looking back, I can also see what I did that I would, indeed, call leadership: thinking beyond only what seems important to me, what I see as the path, and integrating and synthesizing what others brought forward, even when initially it seemed at odds with what I proposed. I didn’t just copy and paste from others. I actually thought about it, reflected, in the short amount of time available to us, added, subtracted, rephrased, connected. At the time, I was simply surprised, in a deeply intense way. I couldn’t hide from myself the clarity that my abilities, without anyone knowing who I was, are what called people to reflect and then have their own thoughts affected by mine. It’s not like I wasn’t affected by theirs. It’s more that somehow I was able to make it all come together. I wasn’t an outlier at all! I was a central participant, working intensively with others, not separate. During a recent retreat I co-led with my colleagues and friends Francois Beausoleil and Jeff Brown, I led two sessions on Principle-Based Teaching (my approach to teaching NVC). I was sitting with a group of about twelve people, coaching them deeply on how they can approach different populations in a way that is, in my experience and understanding, far less likely to alienate. This approach, at its essence, involves thinking empathically about what challenges the population in question would have that an NVC trainer or consultant, might have something to offer them about. This is radically different from the way that most of us were taught NVC, which starts from what NVC is and moves outward from there. It’s the difference between requiring others to come to where we are, and creating a bridge that both of us can walk on back and forth. We focused on three groups of people: police, politicians, and doctors. The people in the room were clearly challenged to be able to truly imagine what the people they were thinking about might experience as challenges, or how to frame what those people might want for themselves and what could be offered them from the vast stock of knowledge, experience, wisdom, and love that NVC can provide. I was a bit taken aback and confused. Then one person gave me some profoundly relevant feedback. He asked me to recognize and accept that the fact of struggling had nothing to do with how eager people were to learn and apply. In fact, he was confident that they were all hungry for what I was offering, and still it was immensely challenging for them to be able to integrate and apply it. He wanted me to have some tenderness for them, that’s all; to recognize that what was so easy and natural for me was not so for everyone else. Since tenderness is one of the keys to what I believe can move us forward anywhere, and since I talk about tenderness so often, it was instantly striking for me why I wasn’t experiencing it. The answer was another step in the process of dismantling my separation: I realized that to accept what he said, to offer tenderness, would mean that I would have to acknowledge to myself that there are some things that are easy for me and difficult for others, and that I am habituated to believing that if that were the case, it could only mean separation. Since I want to belong, to be part of the human fabric, how can I acknowledge to myself any difference that threatens to make me appear superior in any way, which would be anathema to my being? Later, in a conversation with a wise woman who sometimes supports me, she asked me if I feel separate from someone from whom I learn something that’s important for me to master. Of course I don’t, I could see that instantly. That’s when she suggested that I am not actually separate from the people who come to study with and learn from me. It’s only a story overlaid on top of what is happening. For the first time, perhaps ever, I could feel the possibility of acknowledging, seeing, and accepting difference without necessarily interpreting it through the lens of separation. On a call a few days ago I took another step in the direction of non-separation. This was an entirely different context in which I was facilitating a complex conversation, quite high stakes, and outside of my own “home community” of NVC. Because of some pressing circumstances in my family, I was unable to prioritize preparing an agenda ahead of time, and came on the call without anyone knowing exactly what we were going to talk about, as this was a meeting that I called. This is when I made the choice, so contrary to everything I have ever heard about the role of an official facilitator, to speak from the depth of my heart about what the project that this call was part of means to me. I even cried while telling them how much this project is intimately connected with my biggest visions for what we can have in the world: the possibility of making truly collaborative decisions, of including all needs of those affected by the decisions made, and of everyone accepting the final result with real willingness rather than as a compromise, with some resentment. Perhaps the opening that happened on the call, the movement towards a deeper understanding of what it would take to bring everyone together much more than ever before, would have happened even without my sharing this, without my opening my heart and expressing with complete vulnerability my own experience. I have no way of knowing. What I do know is that leading as a fully human person rather than as a role feels dramatically more powerful, whole, and effective. I generally lead this way. This time, however, I took some extra risk knowing that at least some of the people on the call might not be as open to it as my NVC students usually are. I am writing about this one, in particular, because I want it to be known what being vulnerable can mean, to have us all embrace in full who we are, in all our facets, as part of our understanding of what leadership means. The last piece I want to share is about my most recent Fearless Heart teleseminar. One of the participants wanted to engage in a discussion related to the topic of an earlier blog piece about blame. In particular, she wanted to explore what it would take to have enough healing that blaming could really stop. In response, I spoke from a place so deep within me that I could barely recognize it. I spoke of my deep concern about healing ever being “scalable” – it’s only some people who have the resources of time, money, and social acceptability that are required for embarking on a path of healing, and it’s just about everyone living who’s had childhood trauma, because we are all socialized, and almost all of us into cultures that are not honoring our needs. Moreover, healing from early wounds is easily a lifelong process, indefinite in length, and we don’t have clear milestones for how to get there. I spoke of my concern that it would just take too long to heal everyone, and that I don’t believe we have that kind of time. I spoke of the path of leadership as an alternative to healing, because it calls on us to leave behind any sense of being a victim, and embracing the full power of making life work for ourselves and everyone around us, all the way to the global level. We all can take steps right now, whoever we are, wherever we are. Waiting for healing is one of the ways that so many of us have been seduced into not taking decisive action. I could tell that something big was happening, not only within me. Even on the phone, I felt the connection, through sound and even beyond. Then I was done, and I suddenly felt exposed, vulnerable in a way I hadn’t expected. I then turned to one of the participants for support, because I have known her for years. I have complete ease and willingness to seek support from those who come to me for learning, and it is part and parcel of my understanding of the role of teachers: to make ourselves humanly understandable so that our students can be inspired by our path, not only our current level of mastery. With her help, I understood what the vulnerability was about. What I was exposing was not some personal stories I shared as part of what I spoke about. 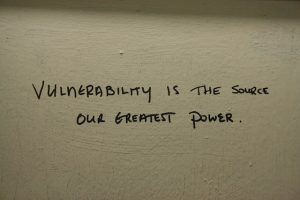 Those are actually easy for me after years of being on the path of vulnerability. Rather, it was the depth from within which I spoke that was the exposure, because in that depth I was risking not being separate any longer. I had to remove even more protection than usual in order to get there. I realized that as much pain and anguish as my sense of being other has signaled, it also has been, in a small and strong way, a source of comfort and familiarity. I was risking losing that, without knowing if I would have the belonging that I so deeply long for. I have been leading from a very small tiny distance. Not big, because being on the path I have been is incompatible with much distance. Just enough to maintain the set of internal habits that have sustained me through so much imposed distance: a kind of clenched teeth strength about suffering, more than any other, which has enable me to continue despite difficult circumstances. Perhaps I am now ready to lead from a full embrace of my complete and total continuity with other people, however different we are from each other. I have known for a while that I may well be more able to reach people with what I am offering if I can release that separation and speak from an assurance of being one more, regular, human, being. Learn more about them and register here. This entry was posted in Uncategorized and tagged Uncategorized on July 18 / 2014 by Miki Kashtan.